DA Form 7595-2-9 - also known as the "Insert A King Lt" - is a Military form issued and used by the United States Department of the Army. The form - often mistakenly referred to as the DD form 7595-2-9 - was last revised on May 1, 2014. Download an up-to-date fillable PDF version of the DA 7595-2-9 below or request a copy through the chain of command. 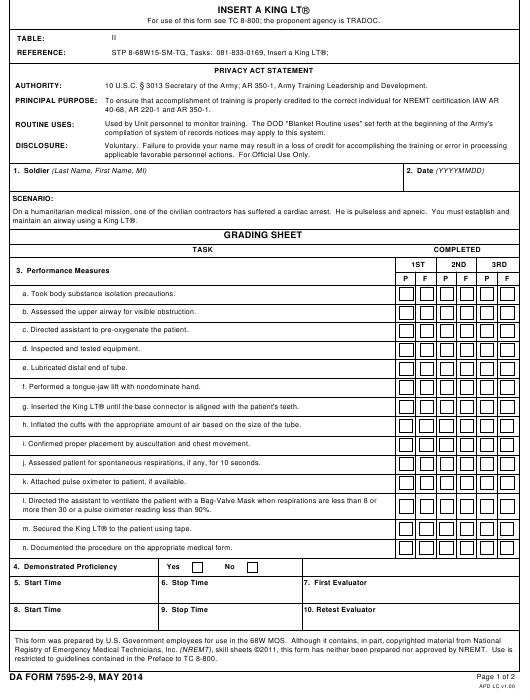 For use of this form see TC 8-800; the proponent agency is TRADOC. 3013 Secretary of the Army; AR 350-1, Army Training Leadership and Development. 40-68, AR 220-1 and AR 350-1.
compilation of system of records notices may apply to this system. applicable favorable personnel actions. For Official Use Only. maintain an airway using a King LT®. a. Took body substance isolation precautions. b. Assessed the upper airway for visible obstruction. c. Directed assistant to pre-oxygenate the patient. d. Inspected and tested equipment. e. Lubricated distal end of tube. f. Performed a tongue-jaw lift with nondominate hand. g. Inserted the King LT® until the base connector is aligned with the patient's teeth. h. Inflated the cuffs with the appropriate amount of air based on the size of the tube. i. Confirmed proper placement by auscultation and chest movement. j. Assessed patient for spontaneous respirations, if any, for 10 seconds. k. Attached pulse oximeter to patient, if available. more then 30 or a pulse oximeter reading less than 90%. m. Secured the King LT® to the patient using tape. n. Documented the procedure on the appropriate medical form. restricted to guidelines contained in the Preface to TC 8-800.